Humans are visual beings and are more likely to pay attention to posts with images or videos (also see memes, below). Hyperlinks to webpages are important to include if referencing a recent study, blog post or news story, for example. By using a tag, you can also increase a post’s visibility. “Tagging” individuals or organizations is done by using their social media “handle” (essentially their username for the social media platform) in your post preceded by the @ sign. It works a little differently on different social media platforms. 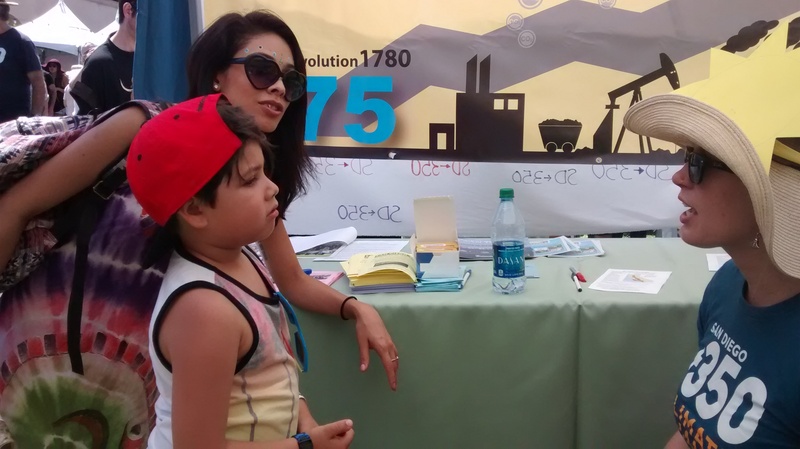 To tag SanDiego350 or the local organization Climate Action Campaign or SANDAG on Twitter, include @SanDiego350 or @sdclimateaction or @SANDAG respectively in your post. You can usually get an organization’s Twitter handle by going to their website and clicking on their Twitter link from there. Tag your friends, elected officials or media outlets to get their attention for your post (they’ll see the post in their feed and get a notification). 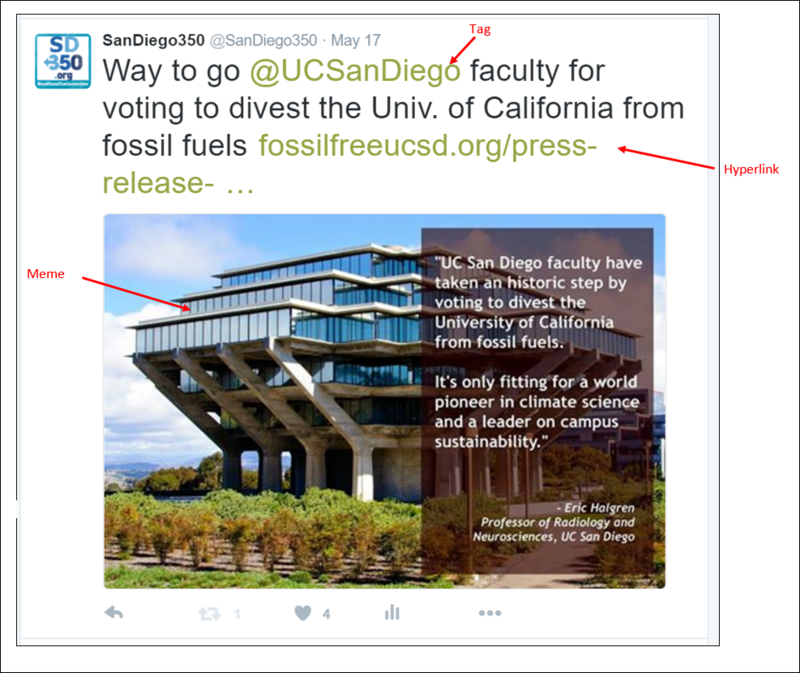 Twitter post (tweet) by SanDiego350 tagging UC San Diego, hyperlinking to a Press Release and including a meme created by SanDiego350. Facts, quotes, and statistics/numbers can be included in social media posts by using a meme. A meme is an activity, concept, catchphrase or piece of media which spreads, often as mimicry, from person to person via the Internet. Memes are hugely popular and sometimes spread like wildfire on social media. You may remember the Ice Bucket Challenge video meme from 2014. However many memes are simply images with a quote superimposed on them. Memes can be created quite easily using online editor apps such as Canva, Picmonkey and Pixlr. To create a meme even more quickly while on the go, you can download the Wordswag or Typorama applications on your phone. Many times these online editors and apps provide free backgrounds and pictures on which to place your quote/words. You can also use your pictures from your camera or find free domain pictures from websites such as Picjumbo, Pixabay, Freefoto and Wikipedia Commons. A trending topic is a popular hashtag (i.e. keyword or phrase) that people are using to search the social media engine. Conversely, if enough people are searching for the same thing, then the hashtag becomes “trending.” Trending topics are the hot topics in society that are in the forefront of social media search engines, generating buzz such as #EarthToParis and #ClimateRedLine from December’s international conference on climate change in Paris. Climate change is a hot topic (no pun intended:)) and for raising awareness, wouldn’t it be great if we could have it “trending”! Climate activist Fenton Lutunatabua from Fiji uses social media to great effect. In 2014, in Newcastle, Australia, he tweeted, Instagrammed, Flickr’ed, and blogged the protest by Pacific Climate Warriors who were in wooden canoes, blocking a giant freighter that was trying to leave the biggest coal port in the world. With his real-time posts, Fenton got the unfiltered voices of the Pacific Climate Warriors rocketed to the internet and grabbed headlines around the world. See Fighting climate change with Snapchat? Meet the Pacific Islander trying it out. Snapchat enables you to easily post mini videos of yourself talking or of a scene unfolding. Lutunatabua has also documented fierce storm weather related to climate change as well as the threat of rising sea levels on Facebook, Instagram, Flickr, and Twitter. Lutunatabua has created quite a following in raising the awareness for climate change, on his personal social media pages and for 350 Pacific. Being active on social media need take only a few minutes any time you have the opportunity. 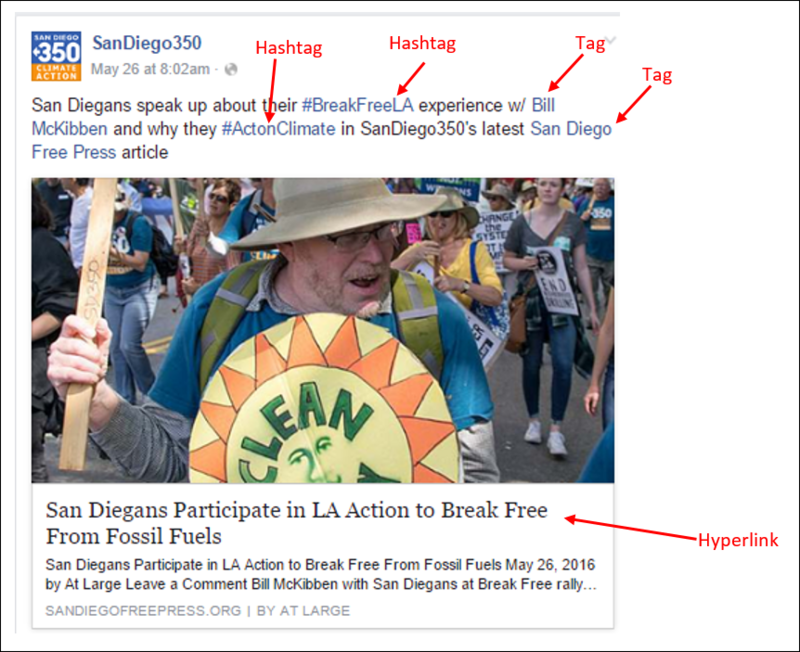 Even if you are just sharing what SanDiego350 is posting on your social media news feed, that’s very helpful. 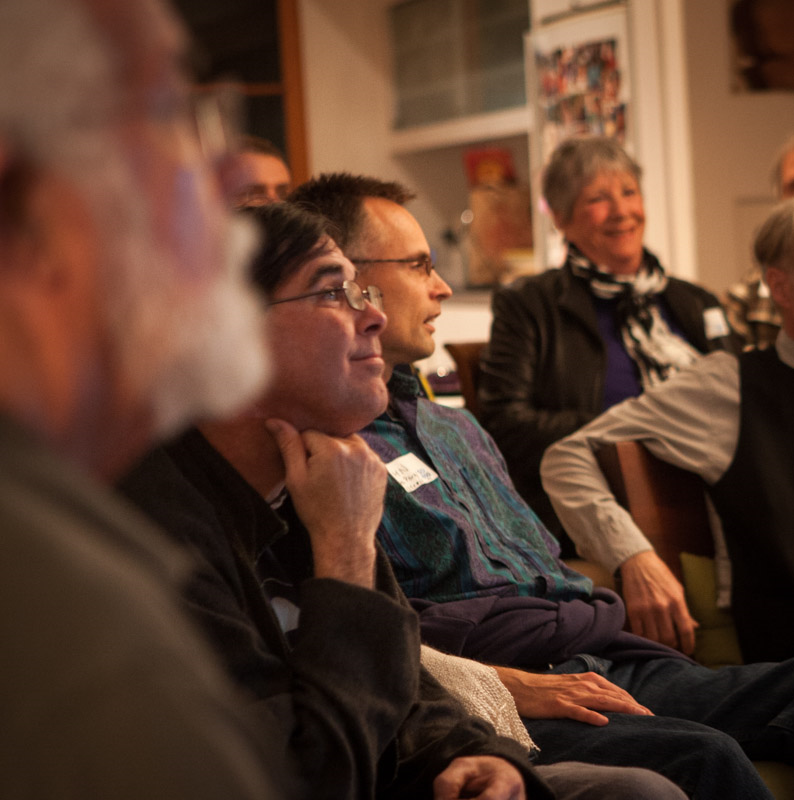 If everyone in SD350 who’s on social media were to post, share and like each other’s climate change posts, then our numbers and influence would grow, impacting our overall social media presence for climate change. It is particularly powerful to create original posts and/or memes about the events you take part in. For example, posting photos of yourself during a climate change action event or livestreaming an event on facebook are great ways to publicize climate change activism. You might even have a post go “viral” which is when upwards of thousands or millions of people like or share the same post! A post may go viral if other people find it interesting, funny, entertaining or unique in some way. Usually it is a meme, picture, or video that goes viral along with interesting stories/blog posts. It’s impossible of course to determine in advance which posts will go viral (or else every post would be viral!). A viral post would also be sometimes be found under “trending” topics. In short, there are many ways to grow the climate change movement by taking advantage of social media. If you haven’t already, start by liking/following some of SanDiego350’s social media sites – listed below. Also try actively engaging through likes, shares and comments. By increasing our numbers and presence on the Internet, we can effect real change, bringing the climate change movement to the forefront of people’s lives. Finally, viral posts and trending posts are considered the “jackpots” of the social media sphere. Let’s aim to hit them! Connie, I already posted a message to you on Motherhood’s Bliss about Sandiego350, but this is more direct. Have a social media idea for sandiego350 that could use immediate action. I would like your comments and action suggestions. Please email and I will send you the idea with two attachments.